Molten Aluminum Refining is white with slightly gray powdery fine particles. Main ingredients are chloride and villiaumite, together with other compounds. After appropriate heat treatment and screening, it turns to uniform size, which is conducive for transferring in refining jar with(N2 or Ar) gas as carrier to the bottom layer of molten aluminum. Through physical and chemical changes in the molten aluminum, numerous small bubbles are formed and fully contact with molten aluminum, separating hydrogen and other harmful gases. At the same time, adsorbing and fusing compounds contained in the refining flux can strongly adsorbing and fusing oxide and float, attaching together to the bubbles, with the rise of the bubbles and being brought to the surface of molten aluminum, so as to achieve the degassing and deslagging purpose of purification. Both environmentally friendly and economically, purifying with AdTech’s refining flux meets the requirement of high value-added & high-tech performance aviation, transportation and other aluminum alloy precise casting production, such as computer hard drive, micron-sized aluminum foil raw material, PS baseboard for printing, canning materials, fan blades for turbojet engine, etc. Molten Aluminum Refining uses molten metal compounding combination principle researching, developing and configuring product. Reducing smoke, depressing burning wastage which protects the environment economically. AdTech’s refining flux solves the problem of traditional massive dosage and ash output refining effect. 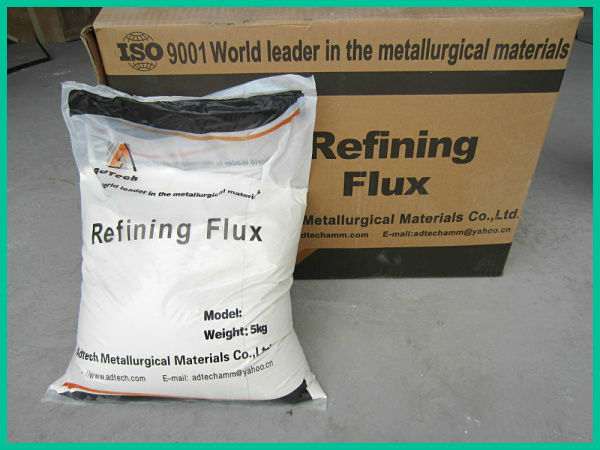 The dosage of AdTech’s refining flux 1.5-2.0kg per ton, with ash output of 0.8-1%, fulfilling high-precision aluminum alloy casting requirement, effectively improving the molten metal yield rate of 0.6-0.8%, achieving energy saving purpose. AdTech’s refining flux is with appropriate heat treatment and screening, it turns to uniform size, which is conducive for transferring in refining jar with(N2 or Ar) gas as carrier to the bottom layer of molten aluminum, which fully solves the traditional problem of tube plugging, failure to uniformly dispersing to ensure quality casting.